Our Organic Kefir Grains have been carefully taken care of. We have obtained them from multiple sources. This helps us offer the best possible kefir with as many different bacteria strains possible. 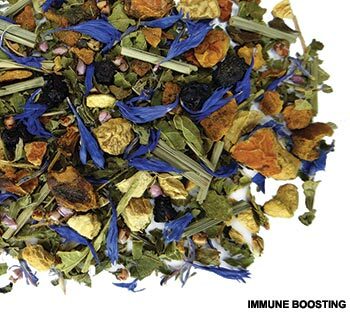 Here at Fusion Teas we are all about health and wellness. These grains are fresh and take very little time activating after their transit time. They have never been dried or stored in a dormant state. We give them fresh milk daily to keep them healthy, active and very well balanced. 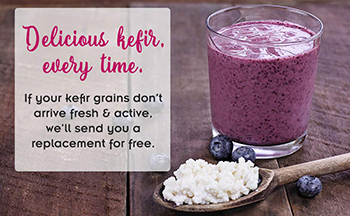 QUALITY GUARANTEE: Our kefir grains are guaranteed to arrive fresh and alive, or we'll send you a replacement free of charge. Your purchase is RISK FREE! PREMIUM ORGANIC GRAINS: Our grains have NEVER been dried or stored in the fridge or freezer. They are shipped to you fresh in a sealed, food grade BPA-free container (not a sandwich baggie like many other sellers use!). COMPREHENSIVE TUTORIALS: Your purchase includes unlimited email support, so you can ask us your fermenting questions anytime. You’ll also get a BONUS 29-page eBook with images, video tutorial, step-by-step instructions and delicious recipes to create the best tasting kefir again and again. You’ll have our full support in your kefir journey! SAVE MONEY: Your grains can be reused over and over, and will produce plenty of kefir for the whole family. It’s exponentially cheaper than buying kefir at the grocery store! HEALTHY PROBIOTICS: We feed our kefir grains fresh organic milk every day. We carefully cultivate our grains to contain as many strains of healthy bacteria as possible, giving you well balanced probiotics in every sip.